Dr Adam Fox and Professor Stephen Till have published and contributed to many articles about allergies. You can find links to these articles below. Dr Adam Fox appears on ITV This Morning alongside leading journalist and author Emma Amoscato to discuss her book – Living with allergies, with Holly and Philip. White gold: the unstoppable rise of alternative milks. The Guardian takes a look at the billion dollar industry, with input from Dr Adam Fox regarding milk intolerance in children. ‘Half of People Who Think They Have A Food Allergy Do Not’ – Professor Stephen Till discusses the misconception or incorrect diagnosis of allergies amongst patients. BBC Radio 4 interviews Dr Adam Fox regarding the significant increase in food allergies and whether food labels in the law are doing enough to protect allergy sufferers? Allergies are not a fad! Dr Adam Fox talks to BBC Radio 4 about the importance of taking allergies seriously and how parents can identify allergies in children. Dr Adam Fox features in this BBC News documentary, which takes a look at the increase in cows milk protein allergies in babies. Dr Adam Fox talks to the BBC regarding the issues facing allergy sufferers, and advises parents how they can deal with a severe allergic reaction in light of the current epipen shortage. Dr Adam Fox talks to Sky News regarding the global shortage of epipens and how parents of children with food allergies can protect their children until the shortage is rectified. Dr Adam Fox talks to the Guardian about why food allergies in children are on the rise and what parents can do to protect them. Dr Adam Fox responds to the recent tragedy, following the incorrect labelling of a food item’s ingredients and the need for a review of the current laws surrounding food labelling. Dr Adam Fox talks to BBC Radio London, following the recent tragic news story surrounding a food allergy and the importance of labelling food correctly. Dr Adam Fox on BBC news advocating for patients following the proposed cuts to provision of special formulas for milk allergic babies on the NHS. The National Institute for Health Research (NIHR) has awarded Guy’s and St Thomas’ NHS Foundation Trust and King’s College London £64.4 million over five years so their Biomedical Research Centre can continue its groundbreaking research into innovative new treatments for patients. Dr Fox joins the BBC’s Trust Me I’m a Doctor to discuss allergies, diagnosing and treating. 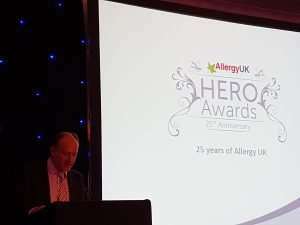 Dr Adam Fox speaks Allergy UK’s prestigious 25th Anniversary Gala and Allergy Hero Awards on The History of Allergy. 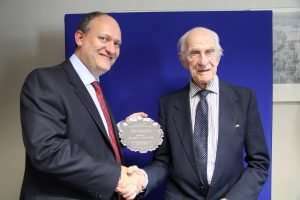 Dr Fox was presented with the prestigious William Frankland Award for Outstanding Services in the field of Clinical Allergy. 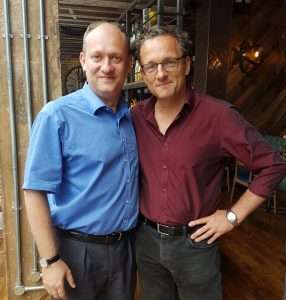 In September Dr Fox will join Dr Michael Mosley on BBC’s Trust Me I’m a Doctor to discuss gluten vs gluten free. Bogus Allergy Tests Causing Real Harm? Dr Fox speaks to The Guardian on the wide range bogus allergy testing available today and how they can do more harm than good. Dr Fox speaks with The Times about the allergy and intolerance tests that readily available but have no scientific basis. Dr Fox speaks to The Times about the groundbreaking immunotherapy treatments for children with sever hayfever. Do epi pens work with the overweight? Dr Adam Fox comments on the recent claims concerning epi pens effectiveness with the overweight. Do We Worry Too Much About What We Eat? Dr Adam Fox speaks to The Guardian about the differences between allergies and intolerances and the associated impact on diet awareness. Dr Adam Fox speaks to The Telegraph regarding the increase in allergies in the modern day. Only being able to eat 6 foods is very difficult for many to even imagine but for a few living with extreme allergies this is a reality. Dr Fox comments on this to The Guardian. Does Being A Couch Potato give You Allergies And Asthma. Allergies are becoming increasingly common, Dr Fox speaks to the Daily Mail about the theories behind this rise. How Allergy Tests Get The Result Horribly Wrong. Dr Adam Fox speaks to the Daily Mail about the importance of taking allergy tests with an expert allergist. Dr Fox speaks to BBC Radio 4 on food allergies, testing and treatment. Dr Fox speaks to BBC Radio 5 about food allergies and how to treat an allergic response. Dr Fox speaks to Daybreak about understanding food allergies. Dr Fox speaks to BBC regarding the rise of allergies. Is the rise in allergies real or is it a false alarm? Dr Fox discusses this with Channel 4 News. BBC2’s Horizon looks at allergies in the modern day.